Getting a visit is both an ATTITUDE and a SKILL. There’s a ‘SYSTEM’ to it. Getting a visit is all about: PREDISPOSING … QUALIFIED PROSPECTS … to take your phone CALL … and ultimately VISIT with you. We’ve included action steps, strategies, and tips to help you make it happen. First, we are professionals. We do not make COLD CALLS! We always PREDISPOSE the prospect/potential investor. We first predispose a potential investor to our phone call to set up the visit, and then we predispose to the visit/ presentation itself (and yes, we even predispose to the follow-up). 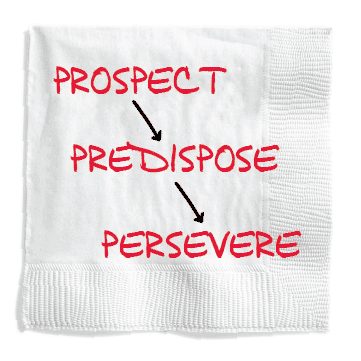 The word PREDISPOSE means to make someone inclined, in advance, to a specific action or attitude. You need to be literally (not figuratively) be predisposing potential investors to expect your contact and look forward to visiting with you about your amazing organization. The goal of predisposition is simple: GET THE VISIT! It is NOT to ‘sell on the phone’! A really strong predisposition e-mail or letter makes the follow-up phone call very assumptive/ presumptive! Consider having someone else set up the visit! This is especially important if you are full-time Development Officer/Major Gift Officer/Chief Development Officer with a portfolio. You should be making presentations, not setting up visits. A phone call from your CEO/President’s Assistant is one of the absolute best ways to get a visit. The easiest way for the Campaign/Foundation Team of a well-respected hospital to get a visit with their top prospects is to do a simple predisposition email from the CEO, and then ask her wickedly competent and talented assistant does a follow-up phone call to set the visit. The assistant already knows knows all of the CEO’s relationships, and has great existing interaction with both the prospects and their assistants (gatekeepers). GTA means be creative. Set yourself apart. Stand out! Use a ‘memorable experience’. Turn that gala/signature event into predisposition that grabs their attention! You can actually say during an event that someone will be following up to set up a visit. Pick the 50 or 60 very best prospects (out of the 1,000 people who attended) who should get a very customized follow-up note, to set up the phone call to schedule the visit. Use a ‘wow package’ to ensure that the person knows how important this visit is. Rather than sending an email, send an actual letter or packet, with some visuals, and then indicate that this is what you want to share or talk about. Just thinking creatively will set you apart. Everything good in life doesn’t come easy or just happen. Getting a visit takes FOLLOW-UP and PERSEVERANCE. 1. Attitude is everything. Getting a visit is all about SFP: Self-Fulfilling Prophecy! If you’re trying to a get an ‘appointment’ with someone you are convinced doesn’t want to see you, then that is exactly what will happen. The person responsible for getting a visit must go at this with the attitude that the Qualified Prospect wants to be with you, wants to hear the opportunity, and will be the big winner after the visit. This attitude will come through on the phone. 2. Whatever it takes. We know. Old and cheesy coaching cliché. But if you take perseverance and attitude down to the ‘how’, the answer is to do whatever it takes! Call back until they tell you not to call anymore. Stay in contact until you’ve got the visit set up. Call in all of your support team. Whatever it takes. “YES.” Awesome. Get a date and time set. Follow-up with a note to confirm. Send any additional predisposition material for the actual visit itself. “NO.” If this is “No, No time,” but still likes your organization, then you could send them a President’s Circle invitation or even a really strong follow-up letter with a request. If it’s a “No, can’t really see this as a priority, don’t have the financial wherewithal to help,” then you would send a nice ‘thank you’ and MOVE ON! For more on this topic, download and read our For Impact Guidebook: How To Get The Visit.